Year-round hammock enthusiasts know that autumn weather can be unpredictable, yet there is something magical about hanging between two trees, sipping apple cider, and watching the leaves change color overhead—especially on a warm Indian Summer afternoon. To honor the season of pumpkin carving and corn mazes, we’ve created a hammock combination that honors this perfect blue sky fall day with deep red to match the changing leaves of Canadian Maples and the fiery orange foliage of autumn Aspens. 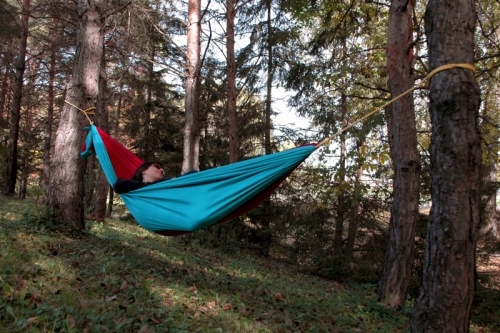 Rest in your Indian Summer hammock and watch the kids jump in the falling leaves. 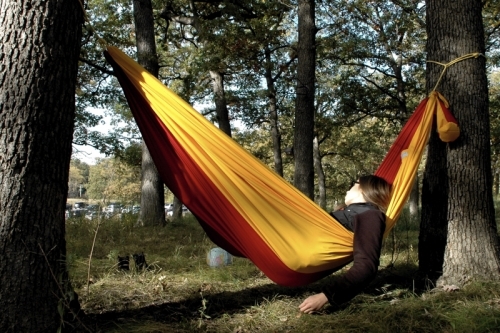 Here’s hoping the only cloud in the sky will be your Color Cloud Hammock. 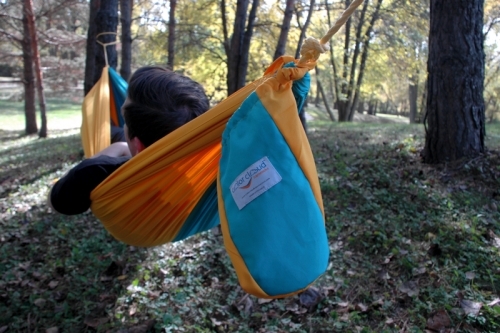 For those days you need an emergency evacuation to the park—or just a mini nap in your backyard, we bring you Lifeboat, the Color Cloud Hammock designed to rescue you from the ordinary. We’ve combined International Orange, regarded by officials everywhere as the color of safety, with our own tropical sea blue, the hue that guarantees deep breathing and broad horizons. Hang your lifeboat in a tree and send out your S.O.S. There is a moment at sea, when the golden sun melts into the blue of the horizon, kissing the ocean goodnight. In this moment of stillness, everything in life slows down and the things that aren’t perfect melt away with the disappearing day. While sunsets can be viewed from anywhere, we know that sailors far and wide have the best vantage point. There is not much more magical than stringing up a hammock on the bow of a ship or the mast of a sailboat and watching the sky dance in the colors of dusk. 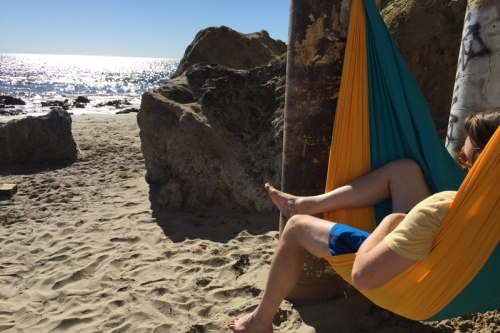 To honor this moment and sunset watching sailors near and far, we’ve designed “On The Bow” the perfect sea-faring hammock, in tropical blue and sunset yellow. It doesn’t matter if you’re drifting at sea or hundreds of miles from the nearest ocean, On the Bow is designed to help you float away. Go on, put your feet up and rock like the sea breeze. It’s a scientific fact, we’d all be happier if we took more naps–especially grownups. Perfected to bring back the midday break we didn’t appreciate enough in kindergarten, we created Sangria Siesta, a signature hammock to encourage naptime for adults. Featuring the deep red of a vintage cabernet to relax you into a deep slumber, we’ve balanced this combo with the sweetness of golden yellow guaranteed to recharge. Don’t worry, this hammock is safe for kids too, and the actual drinking of Sangria while napping is optional (hammock cup holder not included). Sunshine makes the world brighter. It keeps our skin tan, our spirits high, and our hearts warm. Some places have more sunshine than others. Seattleites dream about it. San Diegans expect it. Alaskans say goodbye to it for months. 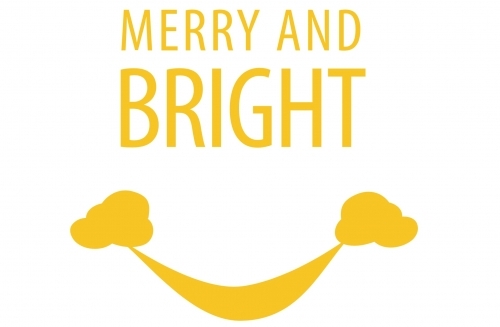 But whether we have too much sunshine or we’re just wishing for it, the truth is that we all need it. And now we’ve found a way to make sure you can get your daily dose of vitamin sunshine regardless of the forecast. 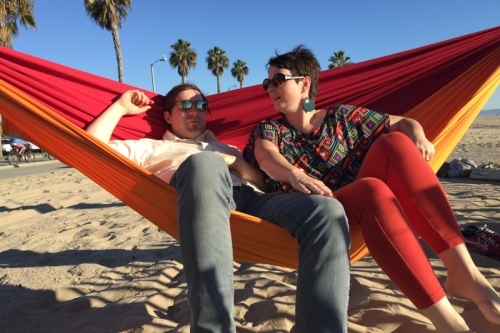 Bright as noon on a sunny day, the Sunshine hammock–a Color Cloud Hammock all time bestseller–is guaranteed to lift your spirits. Yellow and orange not only remind us of the sun, they remind us of the brightness of friendships and joy of life. And if you aren’t getting enough sun yourself, please note, that while Color Cloud hammocks have not yet been recommended by physicians to prevent S.A.D. (seasonal affective disorder), we can guarantee that we’ve actually never seen a sad person in one. I’ve got my sunshine for a cloudy day, do you? 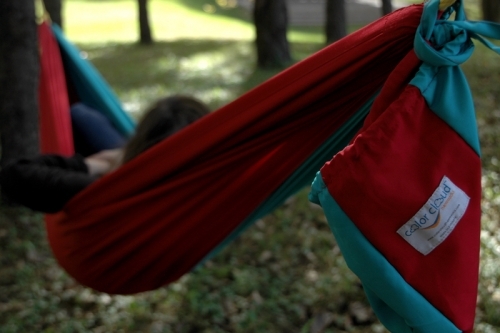 Molten reds meet glacial blues to bring you Fire and Ice, the perfect Color Cloud Hammock combination for every season. 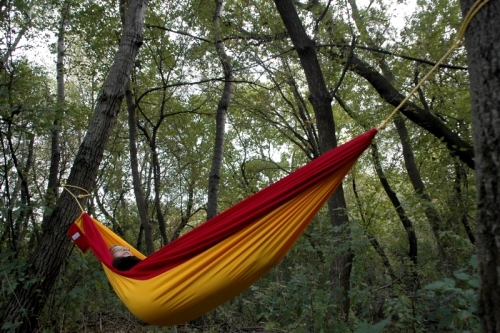 Who says hammocks are just for temperate weather? With Fire and Ice, you can keep cool on the chilly blue side during the fiery days of summer, or snuggle up on the red hot during the frozen days of winter. Not sure what Color Cloud combination to gift? 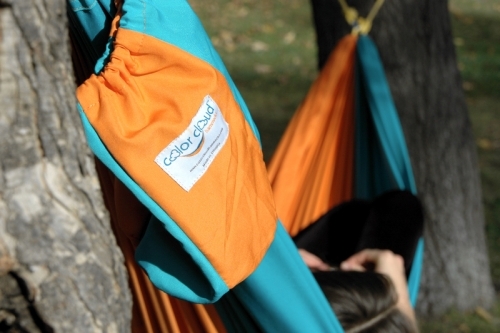 Color Cloud Hammocks has gift cards so you can give a gift your friends and family are sure to love. 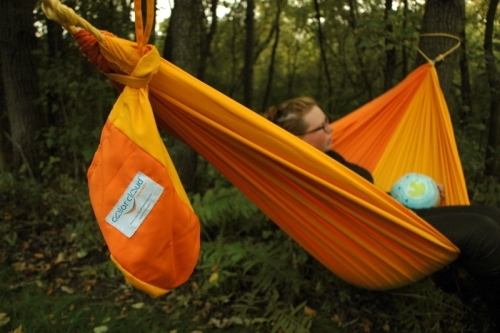 Each Cloud Gift Card includes 1 double hammock and shipping. NOW AVAILABLE! 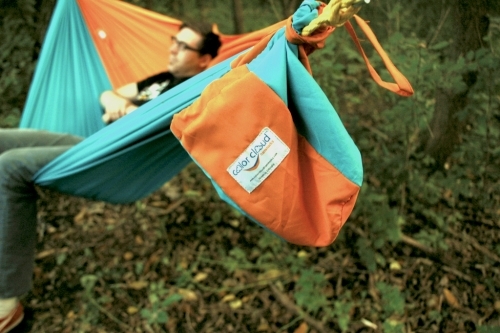 Upgrade your Color Cloud Hammock hanging system with the Cloud Sport Upgrade! 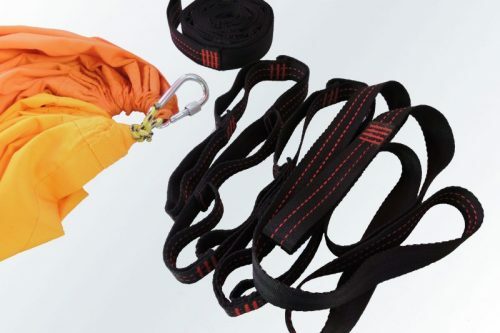 The Cloud Sport Upgrade takes your Cloud to new heights and lengths with two extra-long, extra-tree-friendly, 'daisy-chain' webbing straps that can extend the hanging distance of your hammock up to 19 feet! 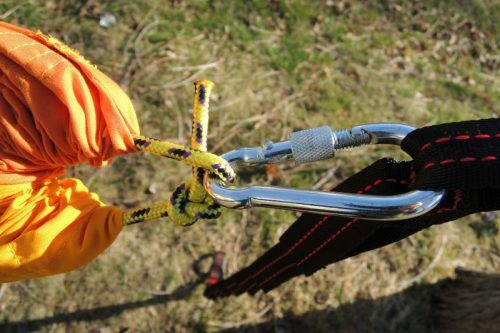 Two heavy-duty, locking carabiners clip to any of 12 loops per strap to find whichever configuration works best for your hammock adventure.